After a one day delay in port at Pascagoula, MS we are currently motoring southwest towards our first survey station in the Gulf of Mexico near Brownsville, TX. 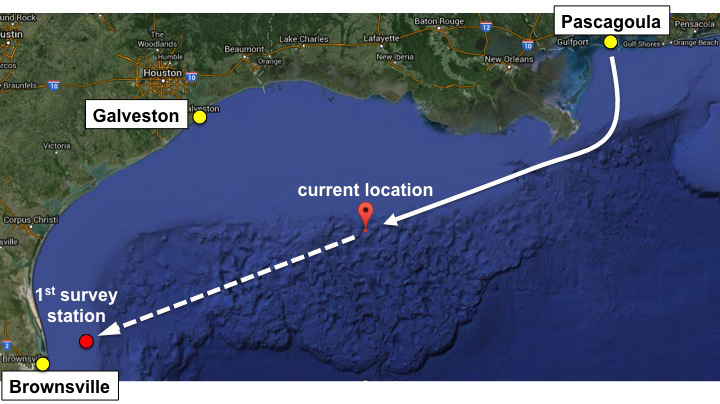 Our survey area will include random stations roughly between Brownsville and Galveston, TX. Survey stations are randomly selected from a predetermined grid of sites. Possible stations fall into three categories: (A) stations in depths 9-55 meters (5-30 fathoms), (B) stations in depths between 55-183 meters (30-100 fathoms), and (C) stations in depths between 183-366 meters (100-200 fathoms). On the current shark longline surveys, 50% of the sites we survey will be category A sites, 40% will be category B sites, and 10% will be category C sites. Environmental data is also collected at each station including water temperature, salinity, and dissolved oxygen. Several questions you may have are why do a shark survey, how do you catch the sharks, and what do you do with the sharks once they are caught? These are great questions and below I will describe the materials and methods we will use to catch and analyze sharks aboard the Oregon II. 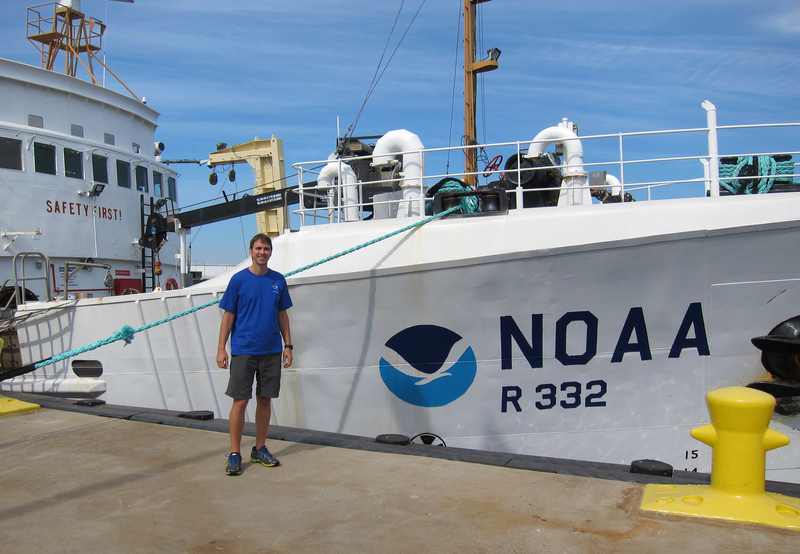 Why does NOAA perform shark surveys? Shark surveys are done to gather information about shark populations in the Gulf of Mexico and to collect morphological measurements (length, weight) and biological samples for research. How are shark surveys performed? 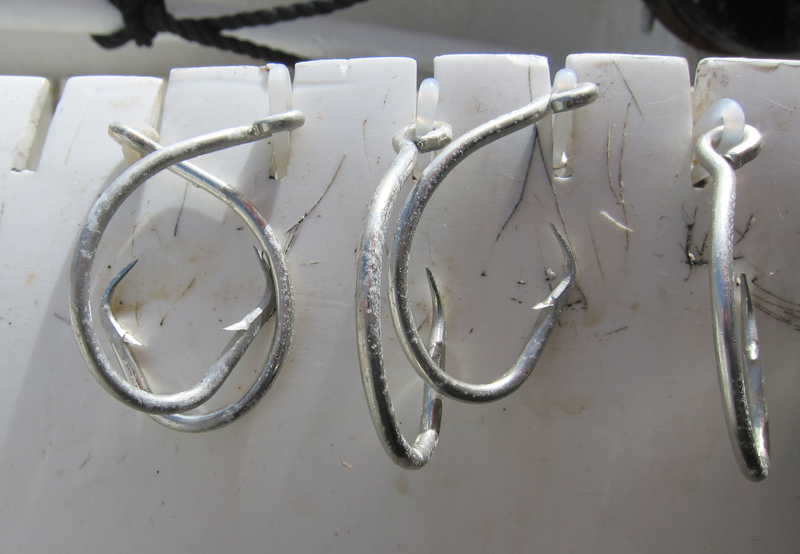 At each collection station, a one mile line of 100 hooks baited with Atlantic Mackerel is used to catch sharks. The line is first attached to a radar reflective highflyer (a type of buoy that can be detected by the ship’s radar). 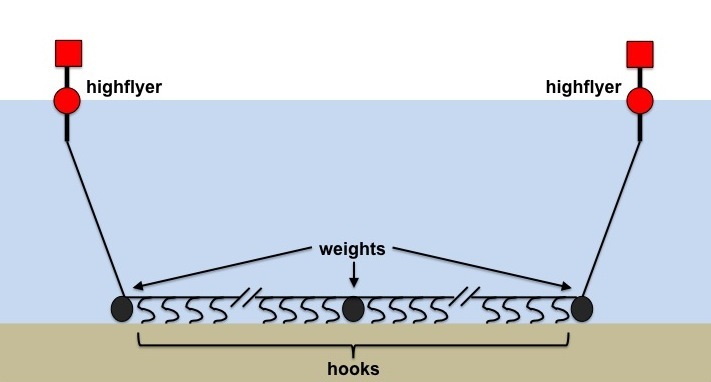 A weight is then attached to the line to make it sink to the bottom. 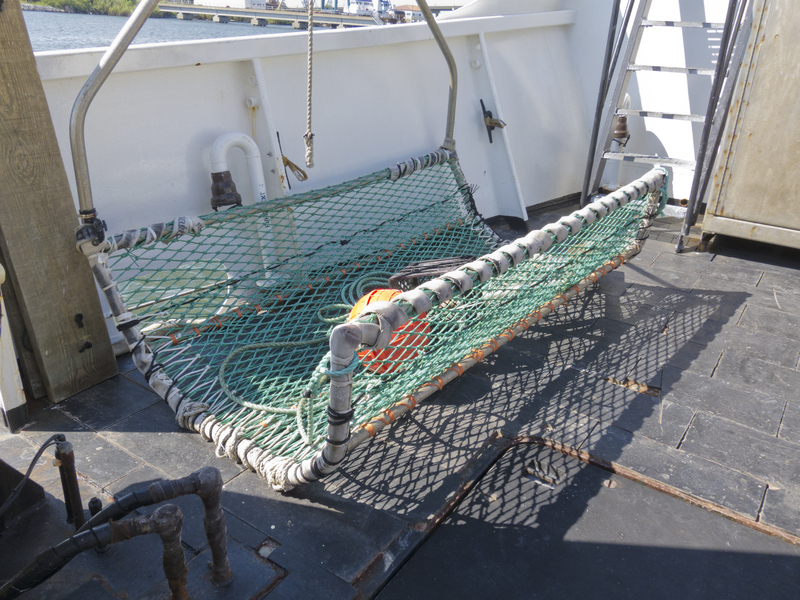 After the weight is added, about 50 gangions with baited hooks are attached to the line. At the half mile point of the line, another weight is attached then the second 50 hooks. After the last hook, a third weight is added then the second highflyer. The line is left in the water for one hour (time between last highflyer deployed and first highflyer retrieved) and then is pulled back on to the boat to assess what has been caught. Small sharks and fishes are brought on deck while larger sharks are lifted into a cradle for processing. What data is collected from the sharks? Researchers collect a variety of samples and information from the caught sharks. First, the survey provides a snapshot of the different shark species and their relative abundance in the Gulf of Mexico. Second, researchers collect data from individual sharks including length, weight and whether the shark is reproductively mature. Some sharks are tagged to gather data about their migration patterns. Each tag has an identification number for the shark and contact information to report information about where the same shark was re-caught. 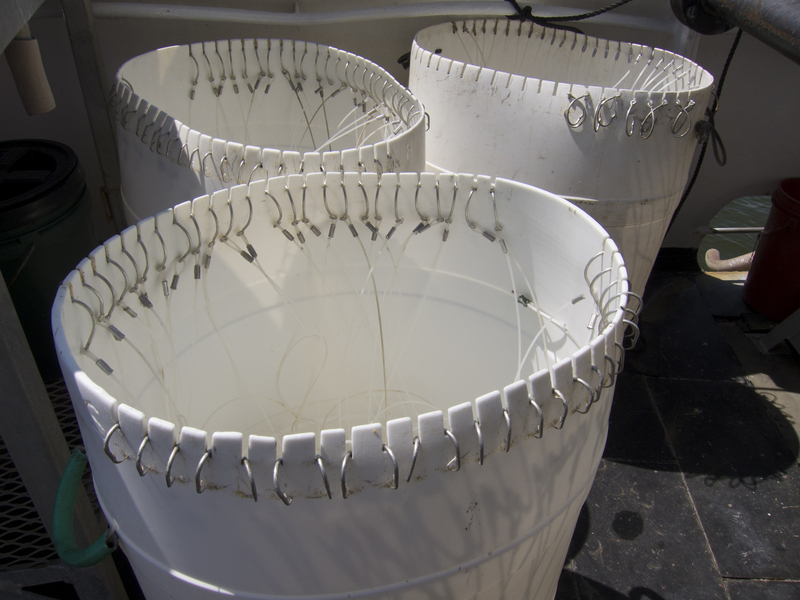 Third, biological samples are collected from sharks for more detailed analyses. Tissues collected include fin clips (for DNA and molecular studies), muscle tissue (for toxicology studies), blood (for hormonal studies), reproductive organs (including embryos if present), and vertebrae (for age and growth studies). One of the desired traits for participants in the Teacher at Sea program is flexibility – cruising schedules and even ports can change. I have now experienced this first-hand as we were delayed in port in Pascagoula, MS for an extra day. Though waiting an extra day really isn’t a big deal, it is hard to wait since myself and the rest of the scientific crew are all anxious to begin the shark survey. Since we also have two days of cruising to reach our first survey site, this means we all have to find ways to pass the time. I have used some of my time trying to learn about the operation of the ship as well as the methods we will be using to perform the longline survey. I also watched a couple movies with other members of the science team. The ship has an amazing library of DVDs. Safety is very important aboard the Oregon II so today we performed several drills including an abandon ship drill. 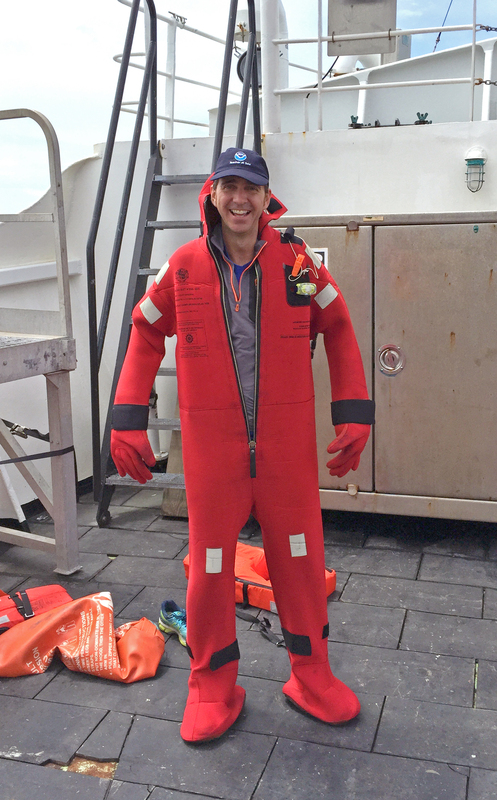 This drill requires you to wear a survival suit. Getting mine on was a tight squeeze but I got the suit on in the required time. The NOAA Commissioned Officer Corps is one of the seven uniformed services of the United States. Can you name the other six uniformed services? Think about this and check the answer at the bottom of this post. NOAA Corps Officers perform many duties that include commanding NOAA’s research and survey vessels, flying NOAA’s hurricane and environmental monitoring planes, and managing scientific and engineering work needed to make wise decisions about our natural resources and environment. Answer: The seven uniformed services of the United States are: (1) Army, (2) Navy, (3) Air Force, (4) Marine Corps, (5) Coast Guard, (6) NOAA Commissioned Officer Corps, and (7) Public Health Service Commissioned Corps. This entry was posted in 2015, Jeffrey Miller, NOAA, NOAA Fisheries Service, NOAA Teacher at Sea and tagged Gulf of Mexico, Jeff Miller, longline survey, NOAA Oregon II, NOAA Teacher at Sea, shark. Bookmark the permalink.